When you drive by a refinery, the smell can be overwhelming. Factory pollution is often thought of as those mostly visible and smelly smokestack emissions. Industry pollutes the water and land around you as well. While you can't visibly see all pollutants, once they enter the atmosphere or the water system; they can spread far and wide beyond the factory. The most common factory air pollutants are greenhouse gases from the burning of fossil fuels. Factories contribute to water and land pollution by acidifying rain, chemical spills and disposal of toxic waste. The most damaging greenhouse gas, carbon dioxide, is released into the atmosphere from the burning of fossil fuels. Factory emissions contribute greatly to the release of carbon dioxide into the atmosphere. 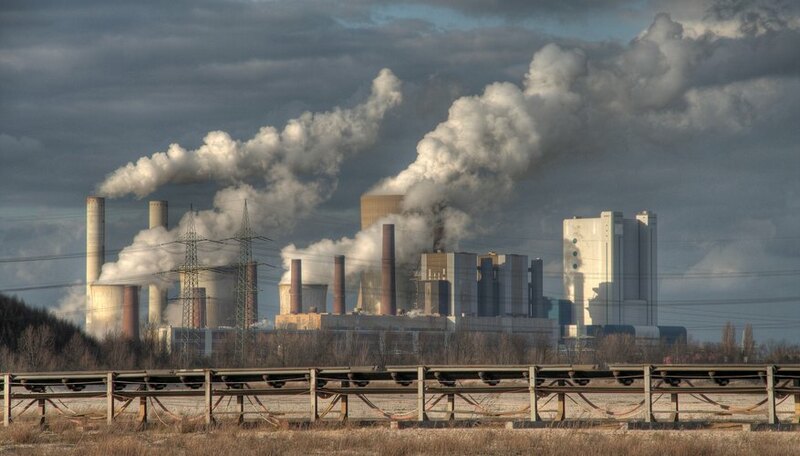 Industry and electrical generating factories contribute slightly more than 50 percent of greenhouse gases. Another harmful gas from the use of fossil fuels is sulfur dioxide, a key ingredient in the formation of acid rain. Sulfur dioxide, however, is a double-edged sword. While it contributes greatly to acid rain, its presence in the atmosphere helps cool the air to counteract the heating caused by carbon dioxide. Another key air pollutant is ozone. Ozone is composed of three oxygen atoms, which is one more atom than needed for breathable oxygen. The third atom creates corrosive oxygen that can damage lungs. Although ozone is useful in the upper atmosphere where it blocks ultraviolet radiation from the sun, it is harmful to human health when present in large quantities in the lower atmosphere. Air pollution from factories and vehicles creates ground ozone problems, or smog, that presents significant health issues. Factories, particularly through the use of large industrial air conditioners, can also release destructive gases, contributing to the depletion of ozone in the upper atmosphere where it is needed. A particular kind of factory called an animal factory, or a concentrated animal feeding operation (CAFO), causes a great deal of air, land and water pollution. CAFOs are highly industrialized and used to produce meat or dairy products in large quantities. These factories produce gases like methane, ammonia and others that lower air quality and are harmful to health. The animal waste that CAFOs produce often ends up in the water table, contaminating streams and lakes with harmful bacteria like E. coli. The waste can also seep into groundwater through soil when it is then utilized in farm fields as fertilizer. Aside from animal waste from CAFO factories, industry also pollutes water sources directly through the dumping of pollutants into streams and lakes. In some countries, the dumping of hazardous waste is highly regulated, but this is not the case in much of the world. National Geographic reports that 70 percent of all industrial pollution is dumped directly into the water table, polluting drinking water. For example, textile-dye waste water produced by clothing factories is creating a major water pollution problem in China. Fortunately, filtration systems are continuously being refined to clean factory waste before it reaches the water supply. Pima County Department of Environmental Quality: What is Ozone? What Gases Pollute the Planet? Peterson, John. "Environmental Pollution Caused by Factories." Sciencing, https://sciencing.com/environmental-pollution-caused-by-factories-12071269.html. 25 June 2018.